The Mediterranean Fan Palms are perfect for your Arizona yard. They have a unique appearance and compact size. The Mediterranean Fan Palms are used as a focal point in yards, around pools, or in a courtyard to make a statement, or as an accent to larger landscape features. 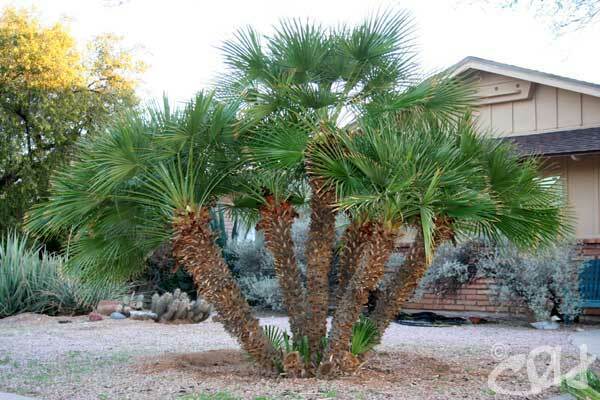 The Mediterranean fan palms are extremely easy to grow and require very minimal pruning and are very durable. They thrive in the intense heat and full sun, require minimal water, and survive our periods of freezing weather with little or no damage. 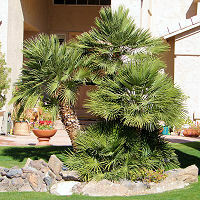 For these palms night-time lighting effects, especially when spotlighted, illuminate the multi-trunk structure well, while the fronds cast unique shadow patterns on nearby walls. Hardiness: 10 degrees, full sun, moderate water. Foliage: Medium green evergreen course foliage. Low Litter, poolside plant, thorns, non-allergenic, flowers in the summer.